Excellent read from a kind of person we should have more of. 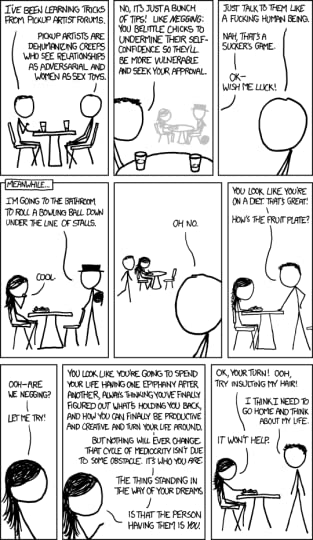 xkcd is one of my favourite web comics. Not that I’m following a whole lot of others; it’s just on the top of a smallish stack. That said, the humour can be very hit or miss depending on the reader’s mastery of the niche subject in question each time. The über math geek jokes fly right over my head but every so often I might be able to understand some of the not-too-obvious computer/internet or somewhat less specific science jokes. This can be very gratifying, therefore I think I can envision the satisfaction one feels when they get the joke, when most others wouldn’t. In that sense there most definitely is something for everyone in xkcd, even for those who could only leniently ever be called geeks. As far as the specifics of this collection of strips go, the selection isn’t bad, though it is a bit outdated by now. I should also note that I can’t for the life of me understand the meaning of the extra sidenotes printed in red throught the book. It would be not at all unfitting of mr. xkcd if he had put them there just to troll readers and make them feel stupid. No biggie though: see above. Overall I’m giving this 4 stars because I think the web presentation suits the material better, not to mention there’s always access to the entirety of the content. But I wouldn’t want to give the impression that I’m complaining, no no: if there ever was an experience worth having, smartphones and laptops barred, reading xkcd on the loo would be it.